We left these lovable and comical characters in Cincinnati at the conclusion of their last adventure as they celebrated Clayton's birthday. Now, picking up the story there, they take in the sights of Cincinnati before heading downstream on the Granny Rose. They think this will be another typical day of cruising on the Ohio River back to their homes in Louisville. But will it? 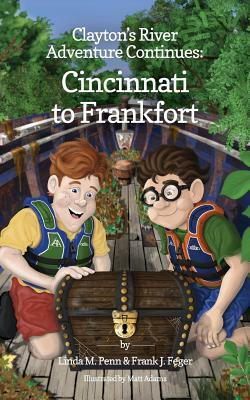 Along the way, after hearing STRANGE GHOSTLIKE NOISES, the group finds an abandoned, rusty ship, meet new people and even find treasure At Grampy's suggestion, the Granny Rose detours from the Ohio River and travels up the Kentucky River from Carrollton to the Kentucky History Center in Frankfort, Ky so the boys' treasures can be delivered there. This book is targeted for third to sixth graders, as was "Clayton's River Adventure I."